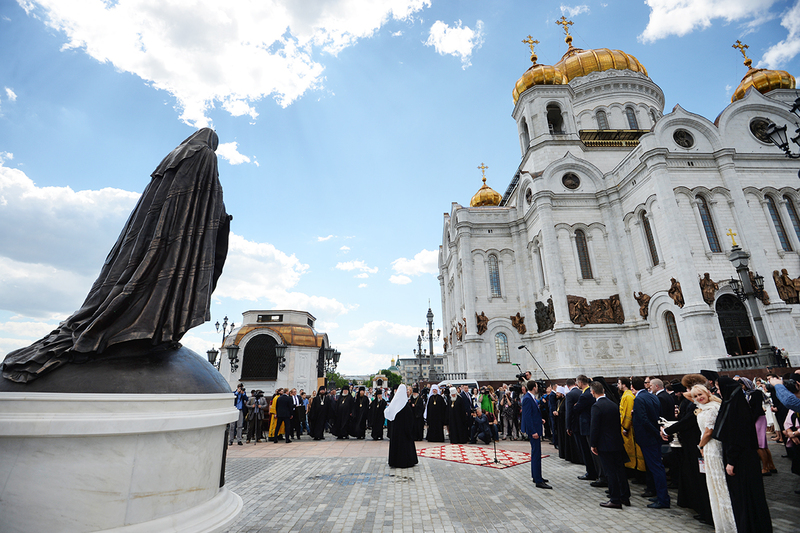 After serving the Divine Liturgy at Christ the Savior Cathedral on Sunday, June 18, His Holiness Patriarch Kirill of Moscow and All Russia consecrated the new monument “Reunification,” dedicated to the signing of the Act of Canonical Communion between the Moscow Patriarchate and the Russian Orthodox Church Outside of Russia, reports Patriarchia.ru. 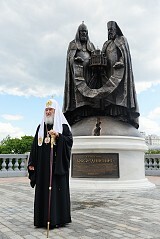 The historic event took place on May 17, 2007 at Moscow’s Christ the Savior Cathedral, with the new monument being timed to its tenth anniversary. 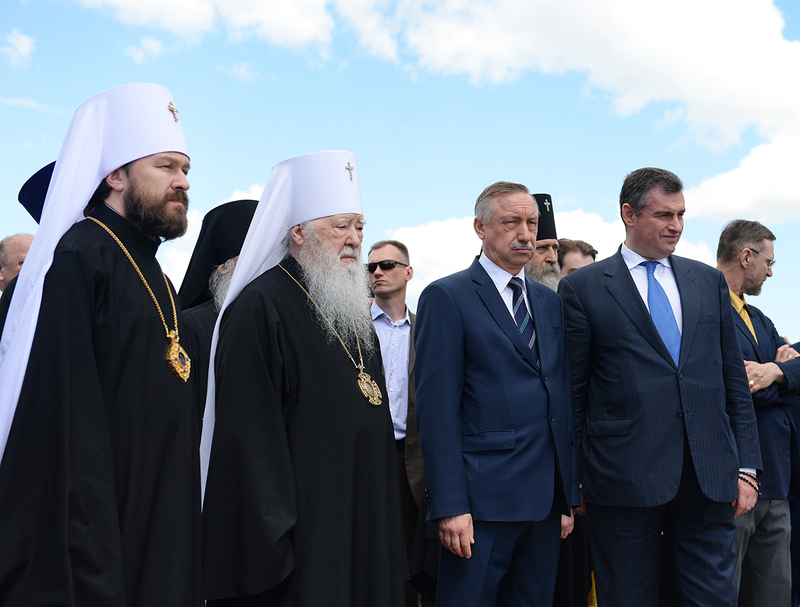 The monument dedication was attended by Metropolitan Juvenaly of Krutitsy and Kolomna, Metropolitan Hilarion of Volokolamsk, Metropolitan Arseny of Istra, Metropolitan Dimitry of Chita and Petrovsk-Zabaykalsky, and other bishops, as well as a number of public officials. 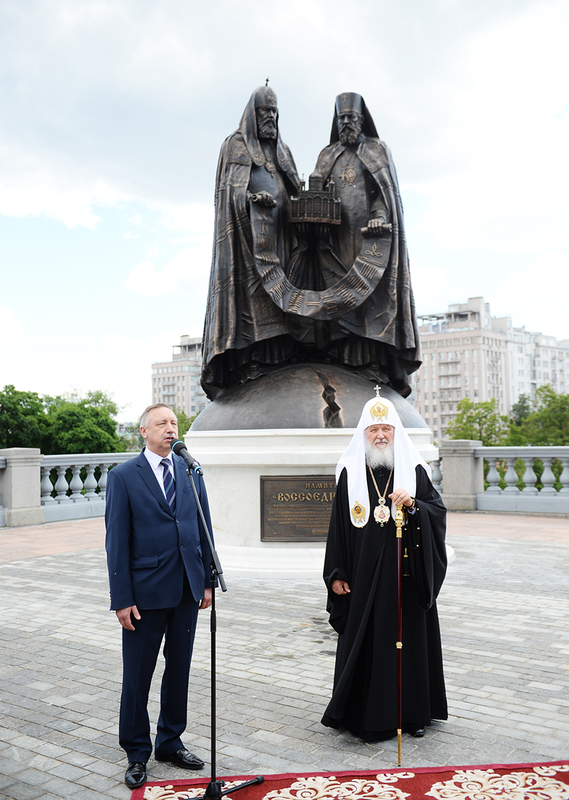 The monument, installed on the east side of the cathedral, depicts the ever-memorable Patriarch Alexey II of Moscow and All Russia, and the First Hierarch of the Russian Orthodox Church Outside of Russia Metropolitan Laurus standing on a broken globe, holding Christ the Savior Cathedral and the Act of Canonical Communion in their hands. Pat. Kirill blessed the beginning of the work on the monument in March 2011, at a meeting with the chairman of the “Church” Foundation A. N. Kuznetsov. The project architect was Goran Dragichevich, and the sculptors Pavel Zhuravlev and Alexander Nozdrin. The monument “Reunification” is dedicated to the signing of the “Act of Canonical Communion” at Christ the Savior Cathedral on May 17, 2007—the reunification of the Russian and Foreign parts of the Orthodox Church—by Patriarch Alexey II of Moscow and All Russia and the First Hierarch of the Russian Orthodox Church Abroad Metropolitan Laurus of Eastern America and New York, with the participation of the President of the Russian Federation Vladimir Putin. Moscow 2017. Following the rite of consecration, Pat. Kirill addressed those gathered, saying the opening of the monument was an important event, in honor of that great even ten years ago. This monument was designed quite wisely. It displays the very essence of what happened in the fate of our people and the fate of our Church. 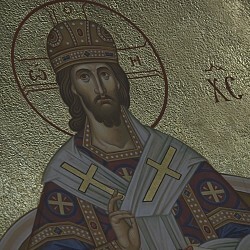 Two hierarchs—His Holiness Pat. 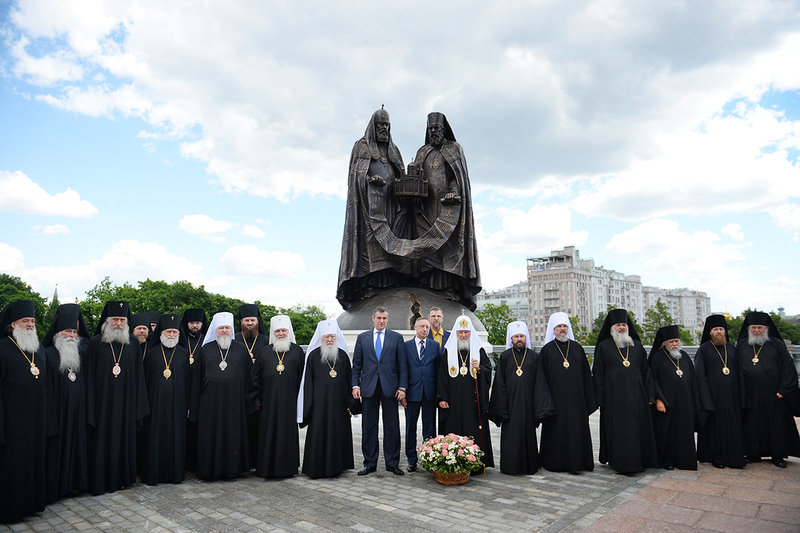 Alexey II and his Eminence Met. Laurus—are standing on a divided Earth. So it was: the Earth was divided, the border ran through people's lives, by geographical borders. One world split into many worlds. The Church mystically and spiritually belongs to eternity, but historically it is in this world, and these divisions divided the historic Church—not the Body of Christ, Patriarch Kirill reflected. [t]en years ago there was a wonderful event—the reunification of the Russian Church. We commend the Russian government and President Vladimir Putin, who also did much to ensure that the two parts of the Church entered into dialogue, without which it would be impossible to connect. We commend all those who worked on the commission for dialogue, overcoming the difficult legacy of the past. We commend his Holiness Pat. Alexey and Met. Laurus, because, in the end, the final result depended on their signatures. And they put their signatures on an historic document, in memory of which is erected this wonderful monument by the walls of Christ the Savior Cathedral, where this historic act was accomplished. Thanks to the “Church” Foundation, another monument to Pat. Alexey II and Met. Laurus was opened in September 2015 at the Kursk Root Hermitage in Kursk, Russia, when the miraculous Kursk Root Icon was visiting from America. In that monument, Pat. Alexey and Met, Laurus are depicted holding the Kursk-Root Icon of the Mother of God “of the Sign,” which has become the main holy icon of the Russian diaspora. Another monument to the patriarch and metropolitan was opened in December 2015 at the St. Alexander Nevsky Cathedral in Howell, NJ, at the diocesan center of the Eastern American Diocese of ROCOR.